It’s one of the biggest party nights of the year: New Year’s Eve. Event planning normally starts months in advance in order to book the great acts. However, if you’re planning a last-minute New Year’s celebration, entertainment may still be available. Our team will help you quickly find unique entertainment for your New Year’s Eve event. Aerial Artistry Entertainment Agency gives you all the resources you need to search for, find, interview and book your New Year’s celebration entertainment. Regardless of what type of New Year’s Eve party you’re throwing or what type of entertainer or vendor you need, you’ll be able to find it on Aerial Artistry Entertainment Catalog . 10 NEW YEAR’S EVE PARTY – 2018 is going sneak up on us sooner than we know it, so if you’re hosting a New Year’s Eve bash, you should start your party planning now! To help us with the task, I asked Aerial Artistry Entrainment Company and event entrainment producer Tatyana Petruk to share some creative party entertainment ideas for an unforgettable New Year’s Eve Party. From making your New Year celebrations unforgettable, check out all of Aerial Artistry tips below! 2. 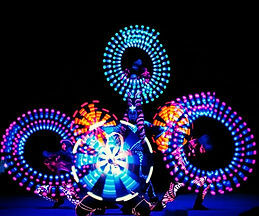 LED Dancers: There is no better way to wow your guests, LED LIGHTS PERFORMERS Light & Glow stilt walkers, cirque performers, aerial acrobats, champagne tables, hula hoops, pixel poi, DJ, jugglers, fibre optic dresses and much more will leave your guests glowing wit h excitement! Nothing lights up an event like an LED perfo rmer especially when fire breather isnt allowed. 3. Aerial Bartenders: Another very new performing art, serves, interacts with your guests, and makes them feel involved in the spectacle! Suspended up in the air from the crystal 7 feet chandelier prop with the bottles often of champagne suspended around the circle. 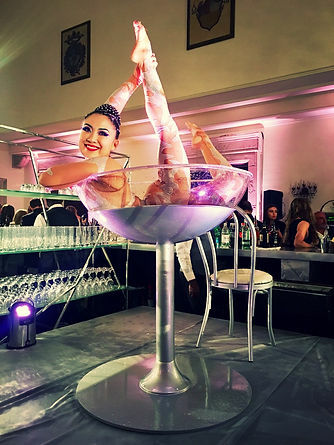 On New Year’s Eve, The aerialist is raised and lowered on a motor as she serve a specialty drinks at the start of the party and champagne at midnight, directly for the guests, hanging upside-down & flipping & spinning through the air. 4. Fire Dancers: Having a Fire Performance at your New Years Eve party is the perfect way to entertain your guests! A fire show will make your first night event a memorable experience for everyone of all ages. Imagine a fire eater and fire breather at YOUR New Years Eve party! Your guests will talk about the fire dancer at your New Years Eve party for years! You’ll see incredible fire acts such as fire belly dance, fire fans, fire staff, fire hula hoop, fire poi, fire hip belt with palm torches, and many more other fire props! 5. The Giant Martini Glass is the perfect centre piece for New Year Eve celebration. Whether you have a performer inside doing a show piece or simply pouring champagne from there. A Giant Martini glass is a sure-fire way to ensure your event stands out royally and remains present on the lips of your guests wherever they may go, and for a gratifyingly persistent time..
6. 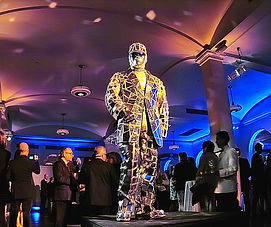 THE MIRROR MAN: Disco/Mirror man- Disco/Mirror Man is a great way to liven up any event. The Disco/Mirror Man employs his body as a canvas where the shattered mirror reproduces the real world. The mirror deflects lights and reflects fragments of everything in his vicinity. Interactively engage your guests and help bring life to your event’s dance floor. Dancing with Disco/Mirror Man is the way to WOW your guests! He will make everybody dancing. 7. ELECTRICAL DJ: instrument/controller called the Hydra; Invented a multi-dimensional it is a rack that has infrared sensors mounted to it that can be “played” by passing your hand through its field of view. The sensors can pick up how fast the hand is moved into and out of its view and at what distance. This information then gets translated into MIDI which can be used to control sounds, lights, lasers, video, you name it. Not only is it cool to look at the correlation between his movements and the music, but also the lasers are just cool to begin with! 8. BURLESQUE PERFORMERS: Burlesque entertainment is a great way to add life to your special occasion. Whether you prefer a traditional witty parody performed or a modern performance with colorful costumes and novelty acts. 9. Aerial Acrobat TISSUE (AERIAL CHIFFON This one you saw on youtube): In a stunning display of grace and strength, our Aerial Chiffon artist floats over and around the audience on the whisper of billowing fabric, performing a breathtaking acrobatic aerial dance, which requires agility, flexibility and enormous skill. A contrasting combination of beauty and power, this act is sure to mesmerize the audience with its exquisite presentation. 10. 3D Human Wallpaper: Body Paint Dancers literally brings the walls to life to blend right in to the wallpaper. The models then stand against the surface to create a striking 3D ‘human wallpaper’ effect.